Children often do not know they are not seeing well! They may be missing what is presented visually at school, causing them to fall behind. 1 in 4 school-age children have vision deficits as reported by Prevent Blindness America. 60% of students with recognized learning problems have undetected vision problems according to American Optometric Association reports. School Sight & Sound, Inc. searches diligently among school populations to find students who may need further testing/examination to rule out vision problems. This is done by using state approved screening equipment and testing instruments. 1) The HOTV (stereoscopic or distance screening) is used for preschool children utilizing matching. c) BRL (both right and left) Test at near and far points in binocular mode for junior and senior high school students. 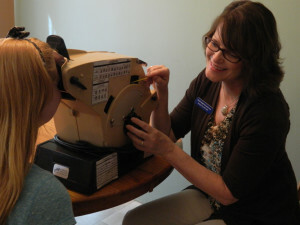 3) Determination of the child’s last visit to an eye doctor. c) Instrument screening of children wearing glasses or contact lenses is not appropriate.